Surrounded by a double ditch and strengthened walls dominating Sèvre, the medieval castle of Clisson was high in XIVe century louse its part Eastern. 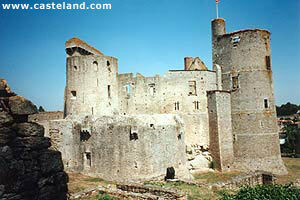 The remainder was built for François II of Brittany in second half of XVe century. Olivier IV of Clisson, constable of France and friend of Bertrand Of Guesclin, was most famous of the lords of Clisson. The castle was burnt in 1793 by the republican armies.